Theodore Phillips, a renowned astronomer, meteorologist, and cleric, was born in Kibworth on 28th March 1868, the son of Abel and Frances Phillips. Abel was curate to Rev Montague Osborn of St Wilfrid’s church, Kibworth. The family moved to Wivelscombe, Somerset, and Theo was educated at Yeovil Grammar School, from where he secured a place at St Edmund’s Hall, Oxford. He gained a B.A. and graduated in 1891, the year in which he was ordained as the curate of Holy Trinity, Taunton. It was about this time that Theo developed his interest in astronomy, the field in which he would become well known. In 1894 he took his M.A. Degree and a year later he was appointed curate at Hendford, where his father was the incumbent vicar. In 1901 he took the curacy at St Saviour’s, Croyden, before moving to Ashtead, Surrey, in 1906. In 1916, he was appointed vicar of Headley, Surrey, remaining there until 1941 when ill health forced his retirement, and he died on 13th May 1942. Phillips’ interest in astronomy grew out of his interest in meteorology. Whilst at Holy Trinity, a member of his congregation gave him a 3” Grubb refractor telescope and he became hooked on studying the heavens, in particular, the planets of Jupiter and Mars. His interest and knowledge of planets saw him serve as director of the Jupiter section of the British Astronomical Association (BAA) from 1900 to 1933 and director of the Saturn section from 1935 to 1940. His work was recognised by the BAA and the Association loaned him various large scale telescopes that were installed in his observatories at each of his clerical appointments. He served on the Council of the Royal Astronomical Society (RAS), almost continuously from 1911 until his death, being Secretary from 1919-1925, and President from 1927-1929. He was awarded the Jackson Gwilt Medal by the Society in 1918 and the Walter Goodacre Medal in 1930. Phillips made more than 30,000 separate observations of Jupiter and his work is contained within the Memoirs of the BAA. Much of his work on Jupiter and Mars remains unpublished in his manuscript notebooks. In 1922 he was appointed by Archbishop Davidson as his representative on behalf of the Church of England to consider the stabilization of Easter. Following this he served on the special Committee of Six to consider Calendar problems in general. He contributed Articles in the Encyclopaedia Britannica on Planets and co-wrote “Splendour of the Heavens” with his friend, W H Stevenson in 1923. He retained his interest in meteorology and kept an unbroken record of temperature and rainfall at his Headley parish for 25 years. One of his best known telescopes, known as the T.E.R. 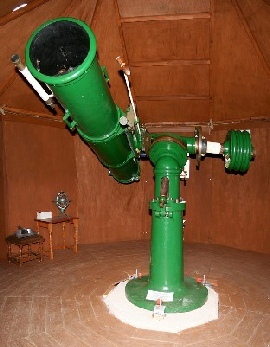 Phillips telescope, was restored to working order and installed in a recreated Victorian observatory at Pendrell Hall College, Staffordshire, although it is currently in storage, following the closure of the college. It is a 12¼” reflecting telescope made by George Calver. Phillips purchased this telescope second-hand in 1907 for £50, the equivalent of 5 month’s salary for a curate. Theodore Phillips is buried at St Mary’s church, Headley. Photograph of Rev Phillips’ headstone at St Mary’s church, Headley, courtesy of Mr George Nixon.